(left) Kenichi Matsuyama, and (right) Mayuko Fukuda and Matsyama in L: Change the World. The Skinny: Kenichi Matsuyama's endearing detective L remains endearing, but the routine virus plot and lack of a proper foil make this thriller a rather unexceptional one. Fan service for fans, and not much for everyone else. 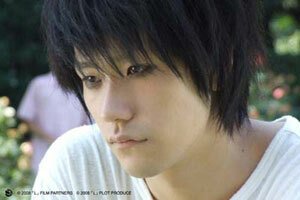 Yay, a spin-off of the Death Note movies starring the loveable and strange detective L (Kenichi Matsuyama)! Too bad the film's really not that good, though to be honest, diehard fans of Matsuyama's popular take on L will likely not care that much. L: Change the World is neither groundbreaking nor noteworthy, and exists mainly as fan service for the people who can't get enough of the slouching, sweets-loving bishonen detective who outwitted the dastardly Light Yagami (Tatsuya Fujiwara) in those Death Note movies. Rabid fans of the blockbuster manga adaptations will probably find this to be a suitable reward for their unabated fandom. However, the uninitiated may need to take a crash course in Death Note lore. It's either that, or wonder why everyone is so excited to see a movie about a modern rock refugee with bad posture. The film cleverly takes place during the final twenty-three days of L's existence, which were predetermined because L wrote his own name in the Death Note in order to trap Light in Death Note: The Last Name. With faithful retainer Watari (Shunji Fujimura) having departed at the end of that film, L is now alone, but he remains focused on his detective work. He begins his final days by refusing the temptation to wield the Death Note himself, burning the offending notes and then proceeding to solve even more crimes remotely for Interpol via laptop computer and various undecipherable charts and statistics. He also continues to devour sweets at a rate that would send your average person into a permanent sugar coma. One final case finds L when a series of connected events converge on his doorstep. L reestablishes contact with K, a member of Wammy's House, the prodigy-raising thinktank that gave birth to L, as well as numerous other letter-named geniuses (no word if James Bond's Q is a member of the ranks). Also, former colleague F dies after discovering a terrible virus in Thailand, but sends L an odd messenger: a young boy who's immune to the virus, and just so happens to be a whiz with numbers. Finally, 12 year-old Maki (Mayuko Fukuda) shows up on L's doorstep bearing another strain of the same virus. Her father Nikaido (Shingo Tsurumi) developed the virus, but some nefarious baddies want control of it. Their goal: to change the world. The bad guys want to provoke an outbreak of this new virus - which is described as a fun combination of the flu and Ebola - so that they can eliminate the majority of the human race, ridding the planet of useless people while also preserving the environment. Oh, they may also be able to make a few bucks on the side. Changing the world? Ridding the planet of useless people? Those sound suspiciously like things that Light Yagami would do, though this connection between the original Death Note concept and the plot of L: Change the World is never truly explored. Unlike the previous films, L is an original screenplay (a novel adaptation was released roughly one month before the film premiere), carving its own fictional niche while making a few welcome, and satisfying nods to Death Note mythology. L is still incredibly quirky and smart, but without the original manga story as backup, the film suffers. L's charisma in the other films came not only from his quirky looks and behavior, but also from his ability to outthink and outwit everyone around him. In L: Change the World, L is presented as always ahead of the game, and there's never truly a moment where his intelligence impresses or entertains the audience. That's both a plus and a minus. The plus is it eliminates some of the heady and wordy exposition that weighed down the Death Note films. The negative is that it makes L: Change the World much less fun or surprising. Not to worry, in place of L whipping his foes with his ultra-powerful brain, we get...character development! The original Death Note manga, anime, and movies were too concerned with Byzantine mindgames and convoluted plotting to deal with actual character development, so the change here is a novel one. This isn't the same "always solving crimes" L that we saw in the other films; this L has time to reflect upon his life and even his feelings, and the minor tweaks to the character are good ones. The filmmakers give L some emotional connection through his interaction with both Maki and the nameless little boy, and Kenichi Matsuyama makes the character's abundant strangeness watchable and endearing. For L fanboys (or fangirls, as is more likely) L: Change the World is enjoyable stuff, especially when you consider that the character will likely not make any more appearances except in prequels - which could still happen. Given the still-continuing fan love for all things Death Note, further adventures of L may already be in the works, pending the success or failure of this film.